Clarke Elementary School students are benefitting from a music outreach program provided by First Presbyterian Church of Henderson. 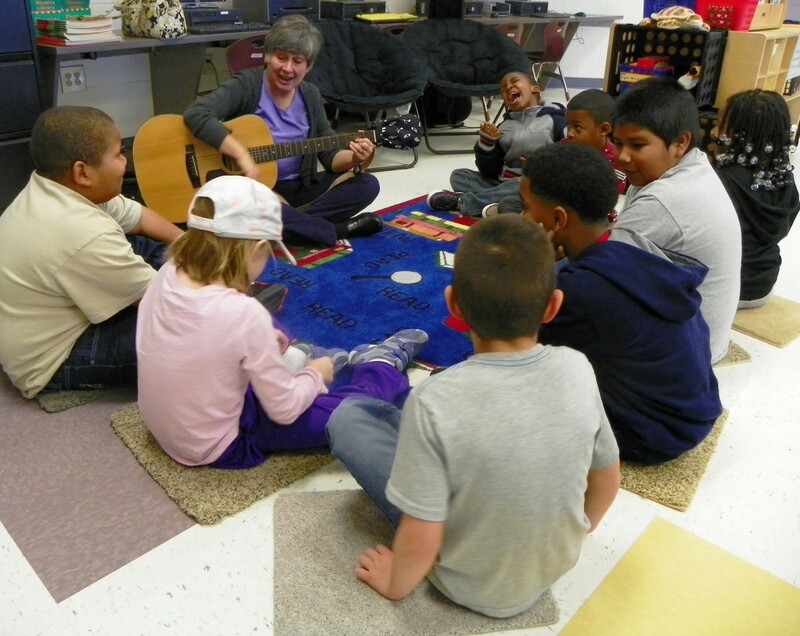 The grant program allows for a music therapist, Cheryl Benze, to visit with special needs students in three classrooms each Wednesday and lead them in music activities. The activities provide lots of opportunities for the students to be actively involved as Benze plays songs on her guitar they can sing along to and dance to, as well as providing instruments for the children to use in songs. Benze visits with students in the classrooms of Jennifer Southerland, Cynthia Moore and Alka Singh. In each classroom, she sits on the floor in a circle with the students. Benze begins the sessions by playing her guitar and singing to each student by name, “Hello, It’s Nice to See You,” as shown in the accompanying photo. The students happily clap their hands and sing along. Benze also plays the guitar as she and the students stand and dance to more music. She leads a second activity where the students each play instruments including bells, shakers, tambourines, small drums and wooden sticks. Benze directs them in each song as to when to play their instruments. In another activity, each student has a bell with a different pitch and Benze directs them with sheet music, that is color coordinated with the color of their bells, on the appropriate time for them to sound the bells. Benze says she has now visited each of the classroom for the last three weeks, with plans to continue throughout the school year. She added that there are plans to expand the music therapy sessions with students in other local elementary schools.